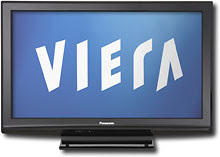 Best Buy is selling a Panasonic VIERA 42" Plasma HDTV with 720p for $498.99. This TV usually retails for $700 dollars. This is an energy star qualified plasma with the following inputs: 2 HDMI slots, 1 S-video, 2 component video, 2 composite and 1 audio. Another unique feature to the TV is the memory card slot so you can view your digital pictures with ease on the TV. If you would like to read up on more of the TV's specs or check out this offer, click here.